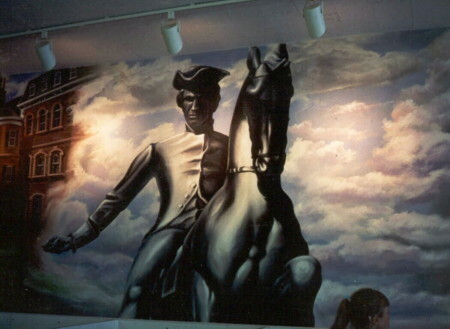 Paul Revere Statue - one of seven Boston landmarks incorporated into the 67' x 9' mural on canvas sections - A ribbon cutting ceremony to commemorate the City of Boston's 300th Anniversary kicked off the restaurant's renovations in 1980. Guest speakers included museum directors, the Mayor of Boston, England and also Lord Boston (of Faversham, England) were invited . 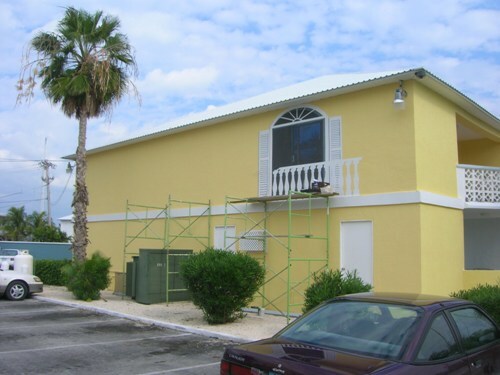 Ocean Reef Yacht Club & Marina 50' x 24' exterior wall project - creating trompe l'oeil balcony effect for incoming guests to see as they arrive to the facility. 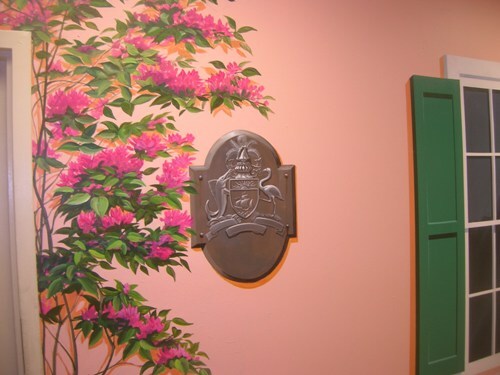 First faux balcony started on semi-textured wall surface. Finished Effect. 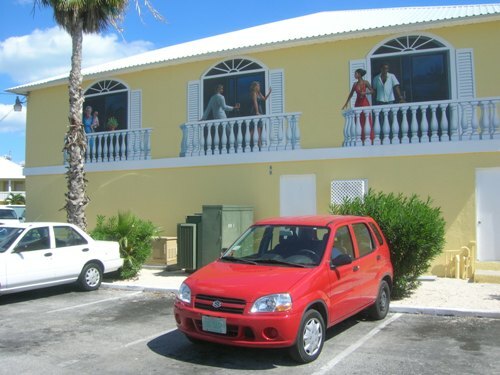 This side of the building fronting the parking lot now has three "window" balconies overlooking incoming taxis and dock area. 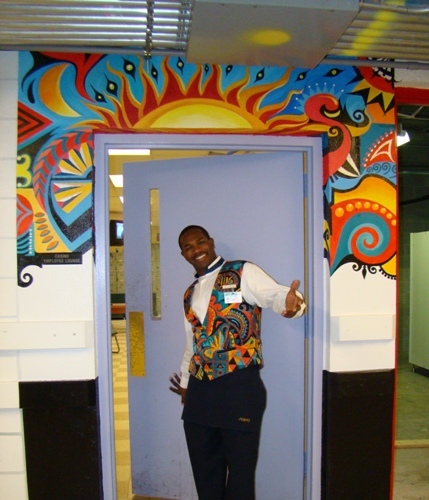 Casino Dealer Lounge entry - Took one look at the colors on the vests all the dealers wear and that was it! 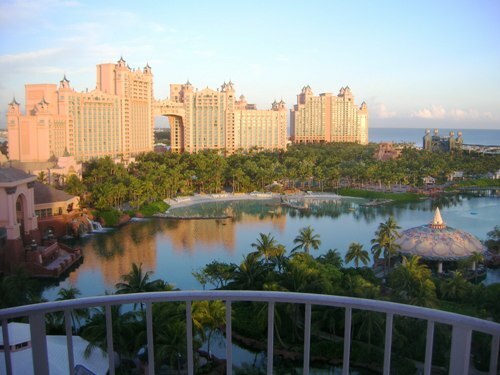 Has a "Junkanoo" holiday feel to the design. 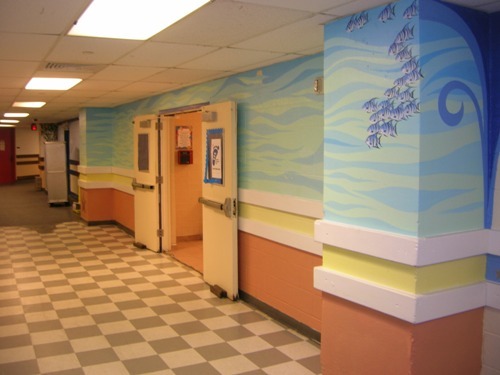 Stars Hallway - outside cafeteria - before new employee award portraits are returned to walls. 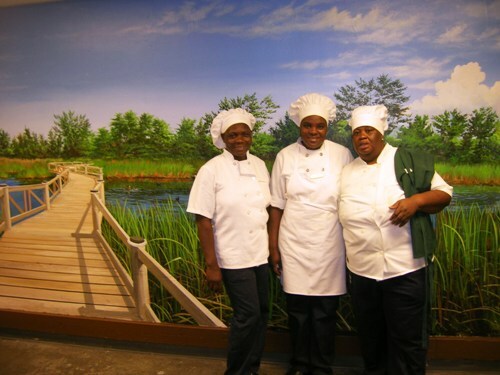 Three cooks in front of Harrold and Wilson Ponds National Park mural just outside of employee cafeteria. 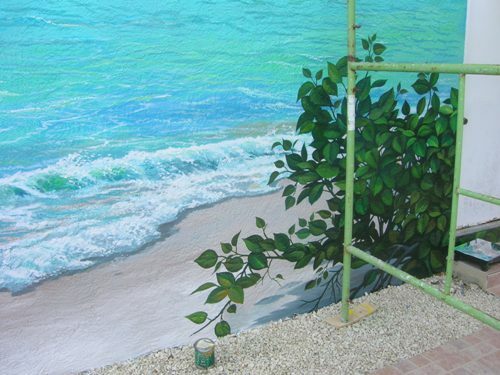 While most of the walls were of concrete block texture, occaisionally a smooth wall would present the opportunity to paint a detailed view of the outdoors. 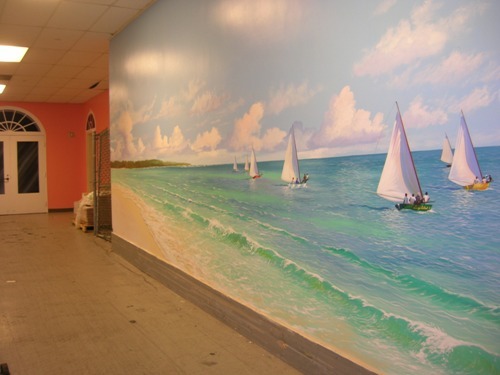 One of the many regattas that occur in the Bahamas seemed to be the solution for this large wall leading to the cashier's entrance. 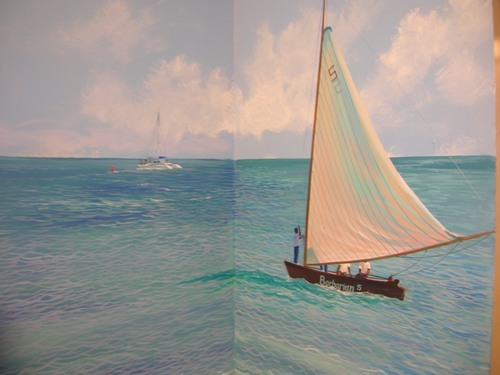 Close up of regatta painting in corner near employee time clock device. 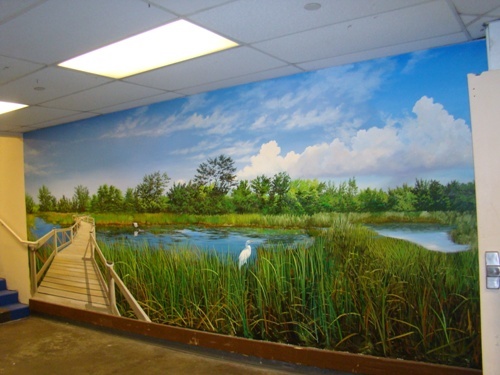 National Park scene 18' x 8' acrylics - marshland scene chosen due to the busy traffic area this space has. 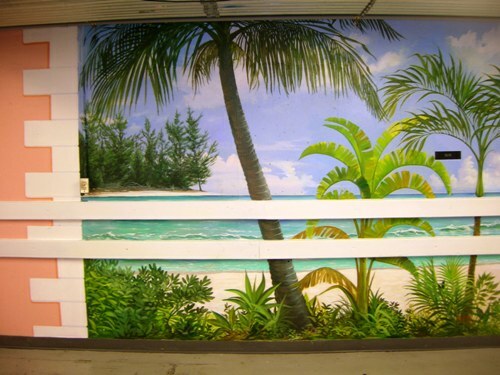 Many pallets of produce are dropped off here - most scrapes or scratches won't be noticable because of the busy patterns of cat tails, tall grass, shrubery patterns on lower part of painting. 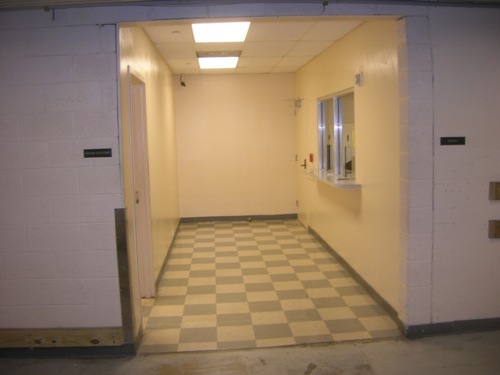 Payroll Department area before beginning work. Department signage on small black tags flanking entry. Payroll area art in progress. 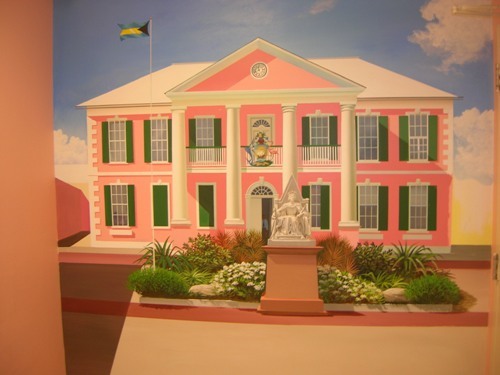 Parliament Square theme to define space using pastel colors, creating faux window and shutters along with national crest/plaque and colorful bougainvillea plant. 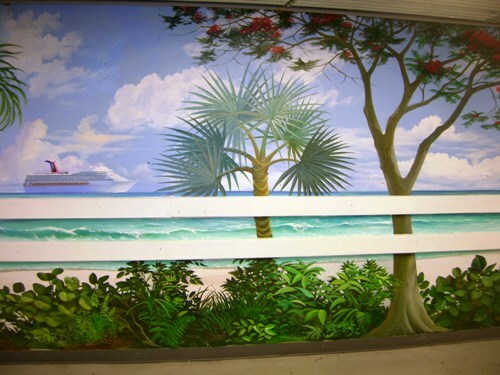 Before starting 50' x 24' exterior mural for Ocean Reef Yacht Club & Resort. 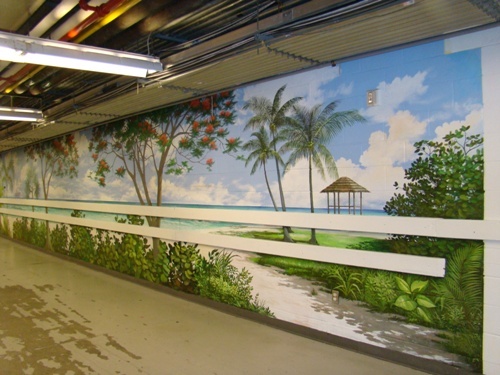 The owner's requested that mural incorporate live plant (clinging for life directly in the middle!) which actually proved helpful in bridging the water scene on the left to the village scene on the right. 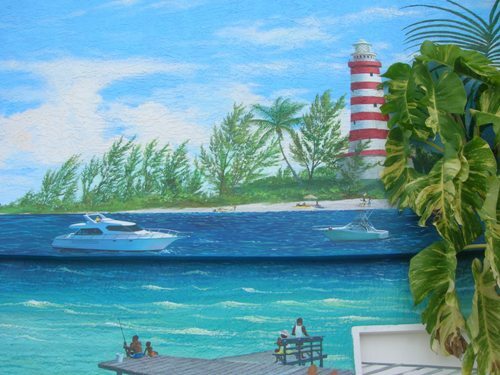 Detail for Ocean Reef project - two story wall with 10 inch ridge - four inches out from main wall - presented a challenge if any horizontal edge, line, mast or tree were to cross it - thus creating distortion. Avoided most crossing over the ridge. Hobbie Cat boat mast & sail "float" because of this but due to the nature of this boat's design vs a regular masted ship, the eye is forgiving. 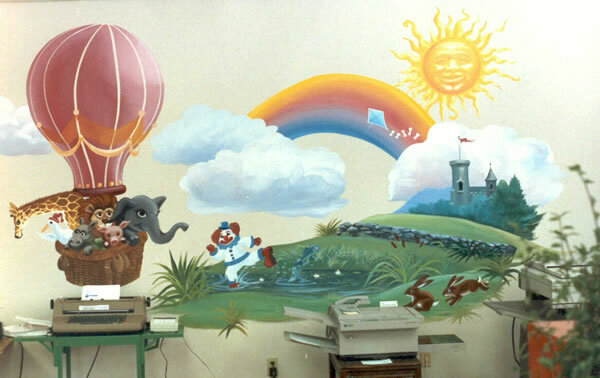 Starting mural - background before foreground colors must be done. 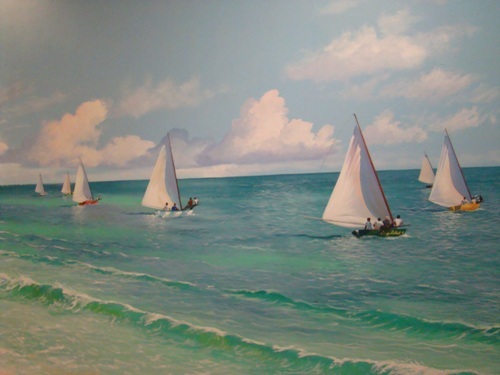 Guests at Ocean Reef Yacht Club & Resort relaxing poolside with new look on hotel wall. 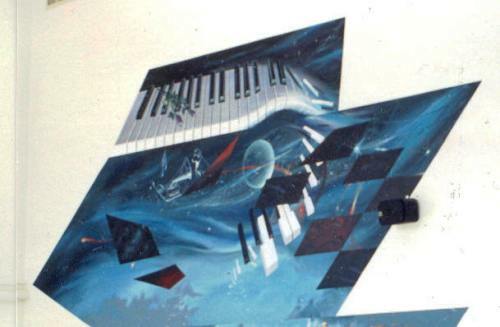 Detail incorporating client's desire for piano keys to be highlighted. 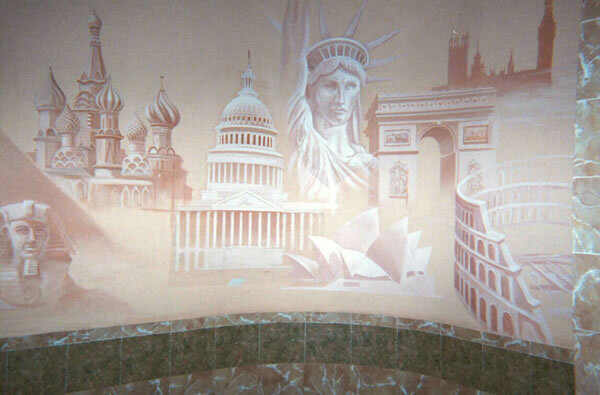 Upper half of mural on canvas wall covering. 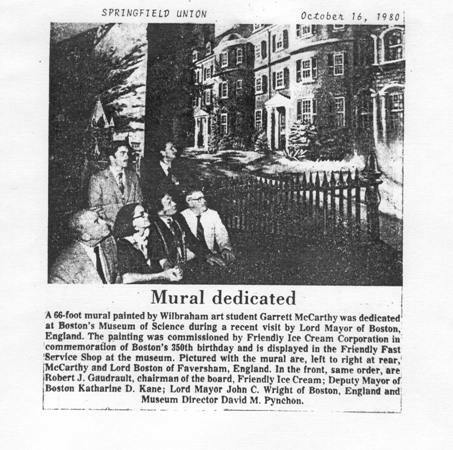 News article appearing in Boston Globe Newspaper. Three years later, while attending Exeter College of Art & Design in Exeter, England, Garrett was invited by Lord Boston of Faversham to the House of Parliament to tour the government facility, meet Lord Carrington - then NATO Commander, and to view "Question Time" as Prime Minister Margaret Thatcher dueled with Labor Party leader Neil Kinnock over policies. 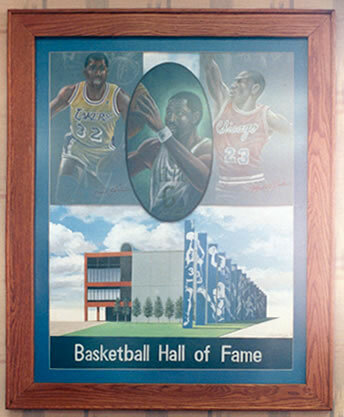 Mixed media (illustration and acrylics) for restaurant location of the former Basketball Hall of Fame Building in Springfield, MA Lose sketch approach of players over painted view of the BHF. 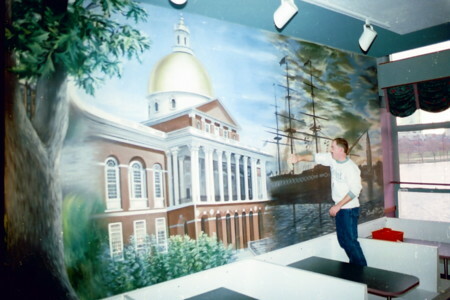 Section of 67' x 9' mural depicting scenes of historic Boston. 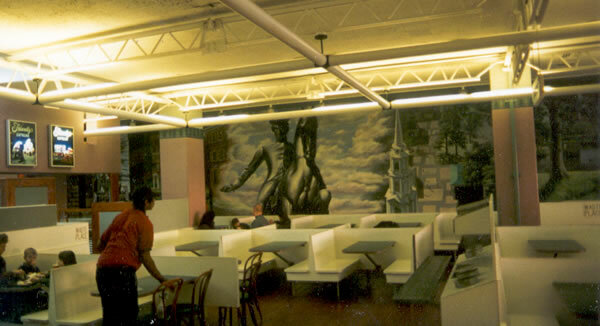 This mural was commissioned in 1980 and installed at the Friendly Restaurant Outlet on the second floor of the Boston Science Museum. 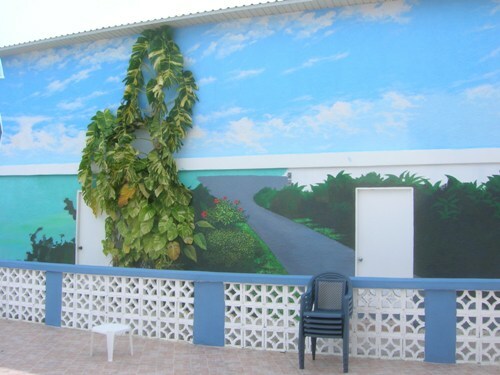 The mural was dedicated to the city's 350th Anniversary with a ribbon cutting ceremony and dinner with the delegation from Boston, England. 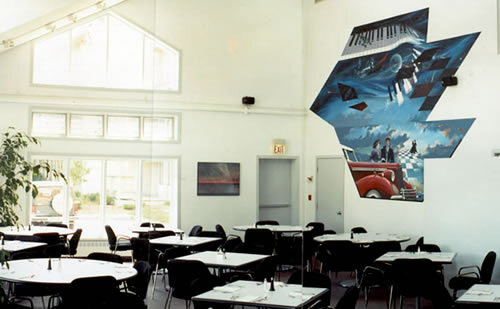 Sectional view of restaurant mural at the Boston Science Museum. 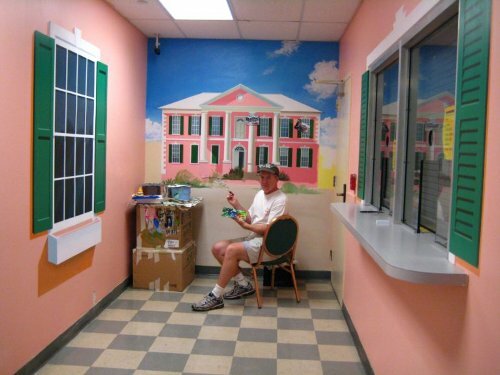 This 3-month long project required 27 canvas strips applied to the display wall. 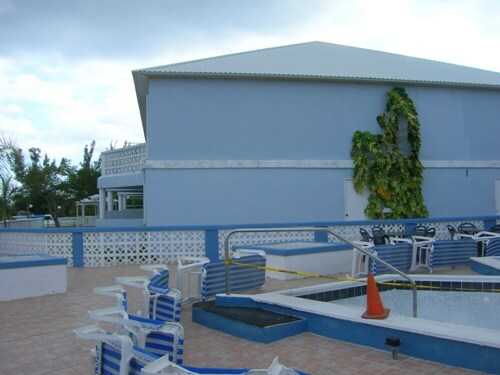 Minimal maintainence was required despite the half million visitors who dined at the restaurant outlet. 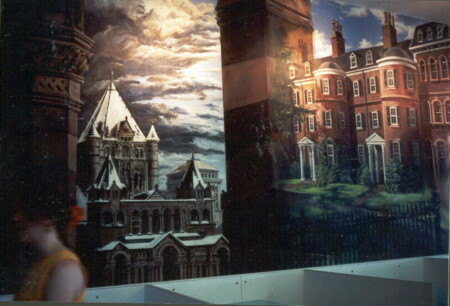 View of historic Boston images - challenge involved blending one scene into the next in an uninterrupted manner. Architectural elements puctuated by the bold Paul Revere form and the birds-eye view of the Park Street Church create a striking visual for pedestrians and patrons. 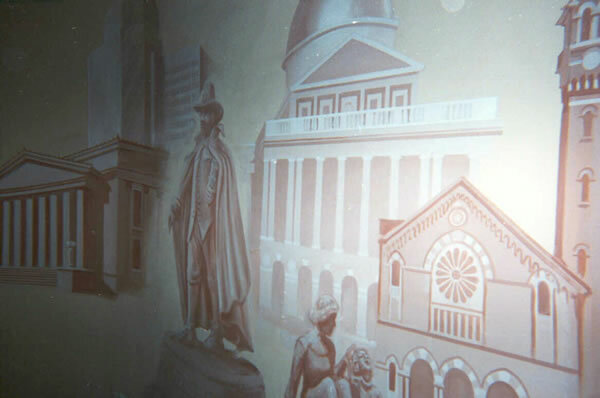 WWLP in Springfield, Massachusetts requested a two-toned collage mural to enhance the studio/news anchor desk featuring recognizable landmarks. 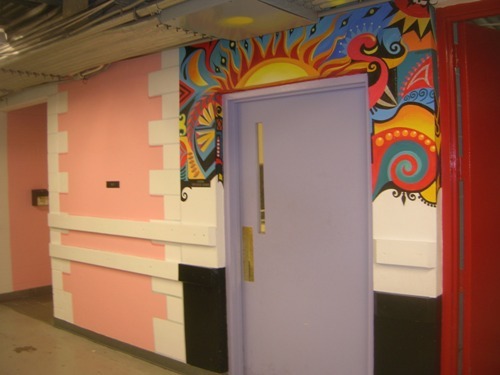 The idea was to match colors with the existing marblized wall effects. 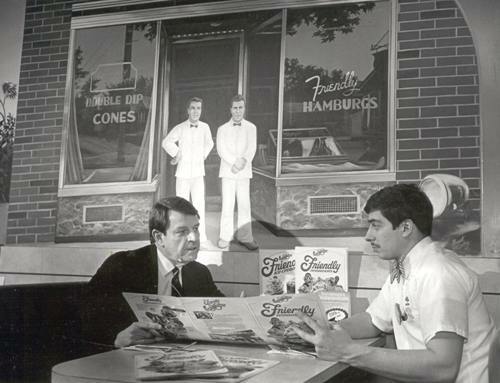 The achor staff coordinated their dress code to contrast well with the set design. 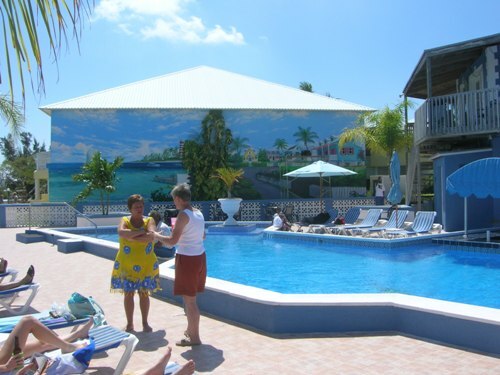 This 5 year set worked well until their construction of new facilities across town. 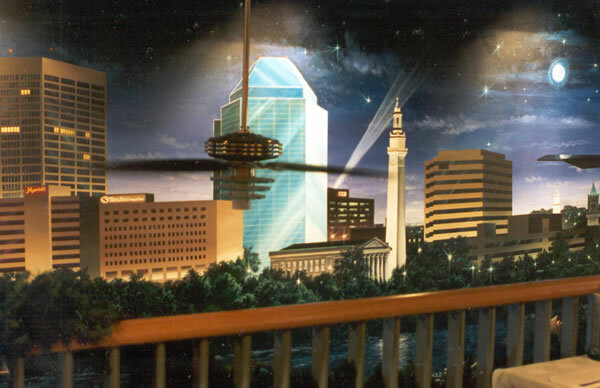 Restaurant mural spanning 25' x 15' of the city skyline of Springfield at night. 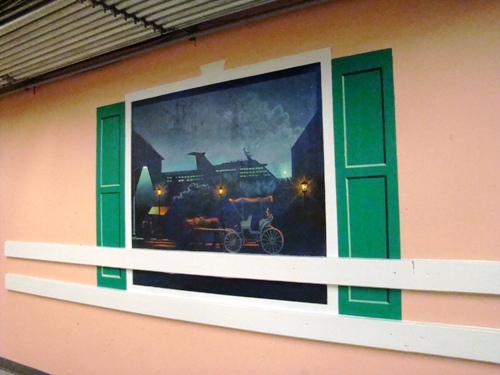 Painted (in acrylics) directly on the wall required a scaffolding approach inside the restaurant during its renovation phase. The track lighting makes the night details "pop" even when viewed from outside the restaurant windows - looking into the restaurant. 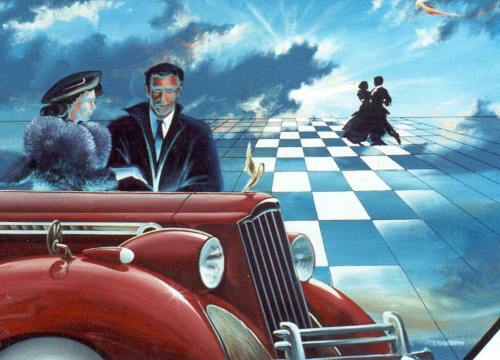 It was a very jazz-like theme for this location as the owner had broght in a gloss black baby grand piano for patrons to be entertained by. 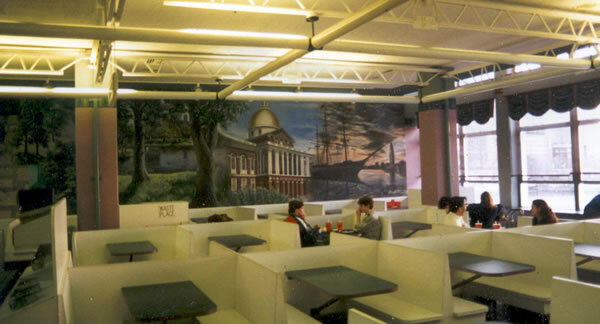 Springfield City Skyline in 1990 - Springfield-on-the-Park Restaurant down on Stearns Square. 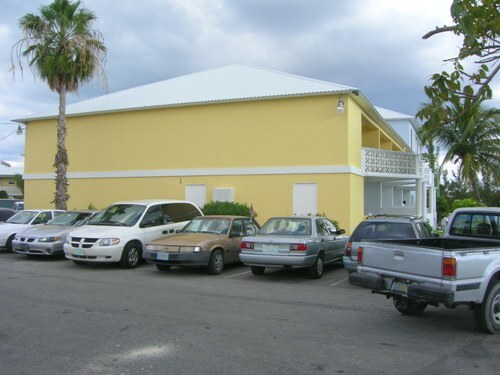 This restaurant had opened amid the highlight of downtown living by office workers and residents who occupied the newly renovated condominium projects in and around Main Street. 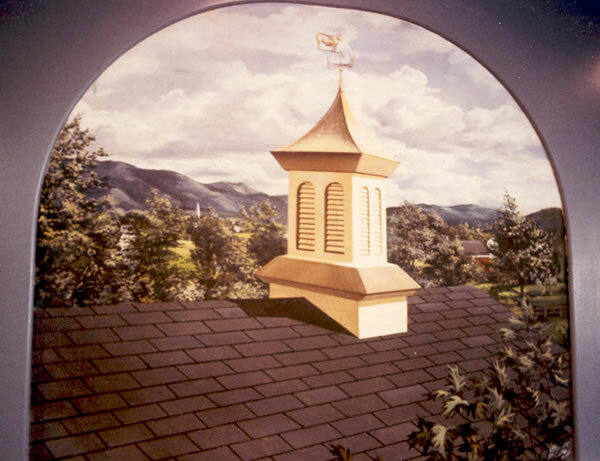 Roof top view of a Friendly's Restaurant - mid 1980's cupola repalcing earlier traditional wood structures in order to reduce maintainence/painting. 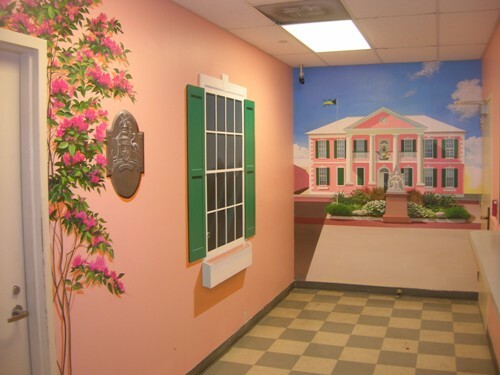 This acrylics on canvas 4' x 5' was part of a series of six restaurant murals located at their Kent Road facilty adjacent to the main HQ. 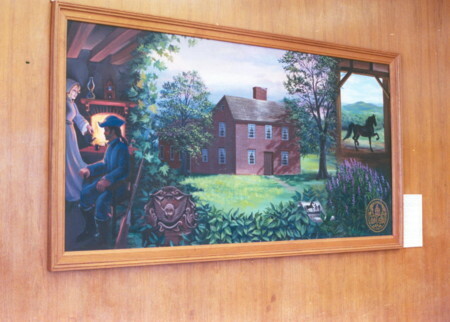 Acrylics on masonite board 8' x 4' History of the Town of West Springfield punctuated by references to the Morgan Horse. 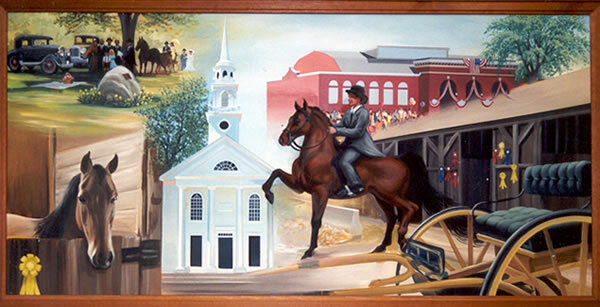 Dedication Ceremony, Eastern States Exposition and historical church featured. 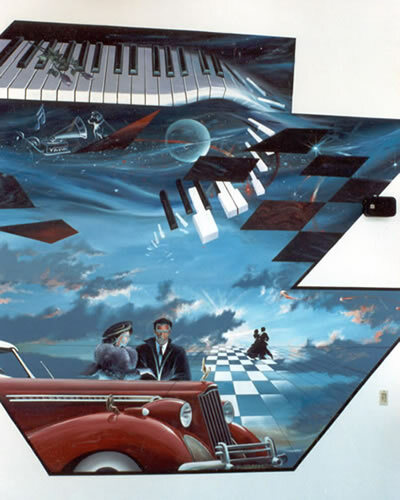 Stratton Mountain Ski Resort Restaurant / Night Club Frontal view of modern shaped mural painted on canvas wall covering - Roughly 12' in height and 15' width. 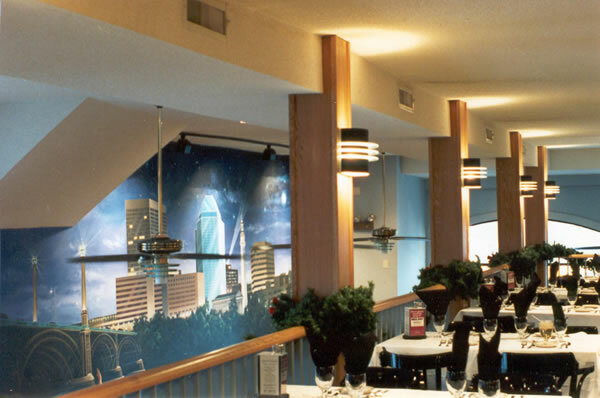 Interior view of restaurant seating area ( Stratton Mountain Ski Resort). 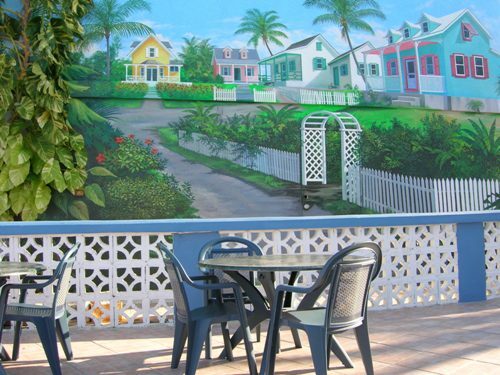 Restaurant owner wanted a modern shape - not rectangular - to compliment interior window design. 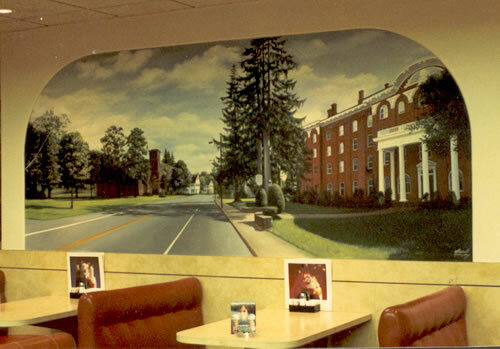 10' x 4' acrylics on canvas wall covering featuring Main Street Wilbraham in front of Rich Hall - Wilbraham Academy. 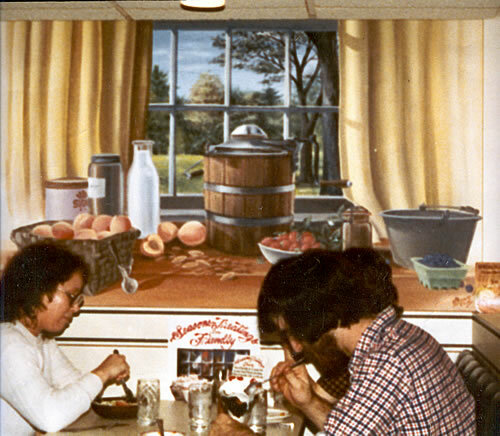 Country kitchen window view painted on canvas wall covering for Friendly Restaurant in Greenfield, Mass. 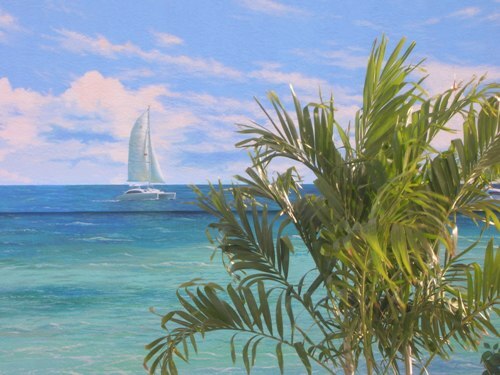 ( one of six paintings) Emphasis on 3-D effect.